Hello and welcome to my second annual gift guide! As I explained in last year’s guide here, nothing makes me happier than giving gifts and finding the perfect thing for someone. 1. 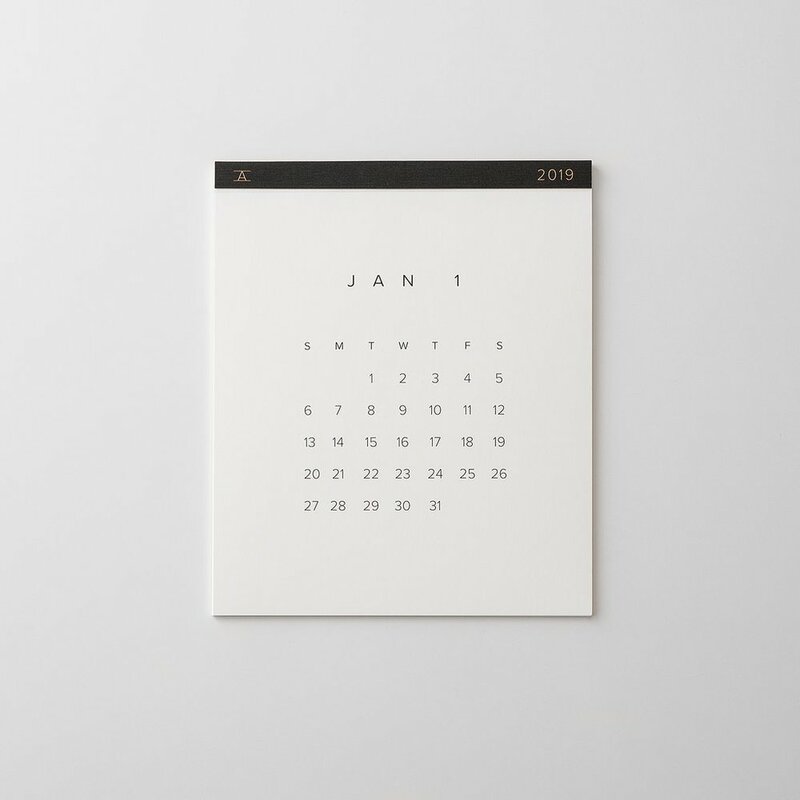 Appointed calendar (Schoolhouse Electric, $38): I haven’t used paper calendars or planners or even notebooks in years, but I bought this calendar for 2018 and I’ve already re-purchased it for 2019, which is a huge endorsement. It’s beautiful and simple and looks perfect on anyone’s desk. 2. 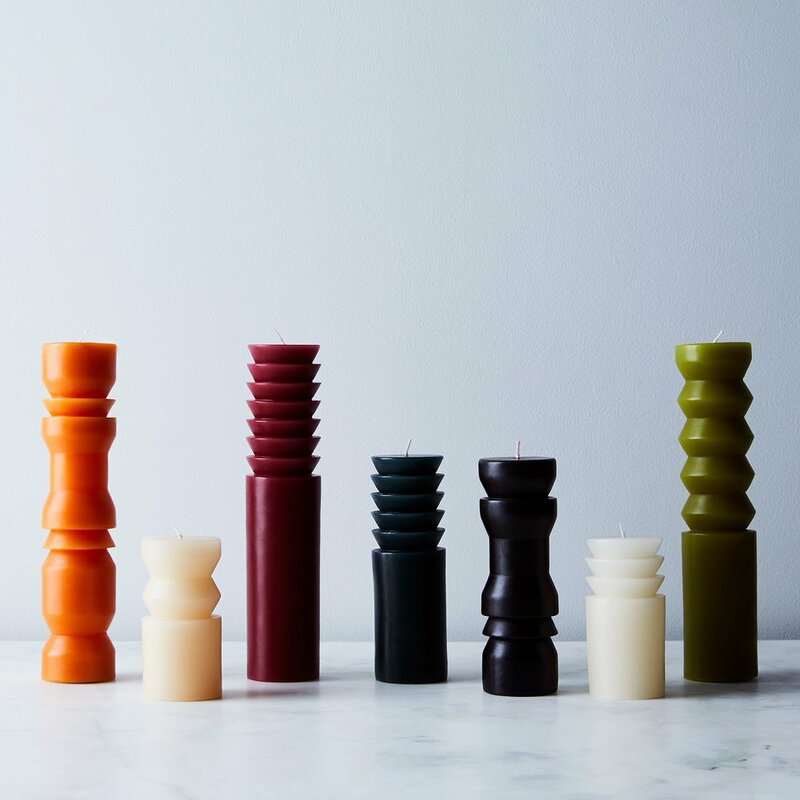 Totem pillar candles ($48 for set of three, Food 52): I’m not a huge candle person but something about the unique shape and color of these candles makes me want to buy every color and fill my house. They’re sold by a number of retailers, but I especially love the unexpected colors like black and green. 3. Wood drying rack (Amazon, $74): In the past few years I’ve started hang drying most of my clothes. The upside is that it really does make your clothes last longer, but the downside is my drying rack lives permanently sitting out in my apartment. My white plastic version finally bit the dust this year, so I replaced it with this beautiful wood version that’s conveniently sold on Amazon (check the dimensions though because some of the larger sizes are huge — I got the medium). 4. Waffle hand towels (Food 52, $35): I’ve been looking for new waffle hand towels for a while now — I love the texture and how they tend to dry faster than thick fluffy ones. The Hawkins New York towels come in the prettiest colors (I’m partial to the mustard), and I also like the Parachute towels. But I ultimately purchased the Onsen towels in “cinder grey” (which happen to be Wirecutter’s pick too), and they punch up my bathroom nicely. They’re currently 30 percent off for Black Friday, too. 5. Finn Juhl Watercolors coffee table book (Amazon, $40): A thoughtful coffee table book is one of my favorite gifts to give. It’s so easy to pick one based on the recipient’s interests. After visiting Copenhagen this summer and admiring the chairs of Finn Juhl, his book of watercolors is the one I’d choose for myself. I also received Ellsworth Kelly and Yayoi Kusama books this year and I love seeing them on my shelf. 6. Monocle travel guide (Amazon, $12 each): You’ve heard me preach the gospel of the Monocle travel guides, which are my favorite way to find quirky, unexpected things to do in popular cities. Give these books to your favorite traveler, even if they don’t have a destination yet, and let them daydream about a trip. My favorite cities to start with are Tokyo, Copenhagen, and Paris. 8. Soap on a rope (Need Supply, $39): This is an absurd present for the bath-loving person in your life. It’s an eight in long pink fish soap on a rope — what more is there to say? It’s charming and smells really nice. I saw it for sale at the extremely chic Merci in Paris, but Need Supply sells it too. Also a good gift for bath lovers is this bamboo tray, for looking chic and resting your book on when you’re in the bath. 9. Block Shop throw pillow (Block Shop, $85): Every single trendy LA makeover recently (see: Mandy Moore’s gorgeous house) has featured this gorgeous Block Shop wood block print. The company makes gorgeous prints, but personally I’m partial to their throw pillow for it’s color and punchy pattern. I have this in my living room and 10/10 would recommend for anyone trying to jazz up their pillows. 10. Case Study Planter ($195, Amazon): The planter that launched a gazillion knock-offs is still a classic that will elevate any room, even if you stick a $10 plant from Home Depot in it (which I do, based on my plant strategy here). I’ve owned mine for several years, and it’s stood the test of time. The white is classic, but I also love the olive green for a more unique spin. 11. Handmade Walnut Bookshelf (Book/Shop, $249): This bookshelf handmade in California would look beautiful on the floor for kids books, on top of a sideboard to display records, or on a tabletop featuring your favorite books. This local Oakland, CA store also has amazing art prints and tote bags that are perfect for the reader in your life. 12. Walnut cutting board (Magnus Lundstrom, $80): Deb Perlman said this is her favorite cutting board and who am I to argue with the queen? I am slowly (mostly) getting rid of the plastic in my kitchen and this cutting board is at the top of my list. If you’re looking for one that’s less expensive or has faster shipping, I have a smaller version of the teak one Wirecutter recommends and it’s excellent ($21 via Amazon here). 13. Ace & Jig Stocking (Schoolhouse Electric, $62): Woven in India and sewn in Portland, this stocking is a collaboration between Schoolhouse Electric and Ace & Jig, two of my favorite brands. Perfect for the understated holiday reveler in your life. 14. Sven Sofa (Article, $1,700): Okay so lol, this is not exactly a stocking stuffer. But I have convinced SIX friends and clients to buy this sofa this year, and absolutely all of them came back with rave reviews. If you’re looking for a comfy sofa that will be delivered in record time (cough, West Elm 12 week deliveries, cough), that comes in a variety of colors and sizes, look no further. Article doesn’t pay me to say this, although they really should TBH. No, you can’t sit on it in a store, but they deliver super fast and they will take it back out of your house within 30 days if you don’t like it. And, if you live in a major metro area, check and see if someone is selling one on Craigslist who would let you go sit in it (or buy it). 15. Perfect Coffee Mug (Need Supply, $30): While I love the look of the gorgeous Heath Ceramics large mug, unfortunately it’s 12 ounces and it always felt a little too small. This year I looked for a slightly larger, 15 ounce mug, and I found two great options. I bought one from The Mill in San Francisco made by Baker/Potter, and while the exact model is sold out, a similar one is for sale here. But I also love the large mug by Hasami, a Japanese brand sold by several retailers in the US. I particularly like the glossy grey version. Happy holidays, everyone! In addition to physical gifts, consider making a donation in their name to California fire relief, Planned Parenthood, or their favorite independent podcasters. This post contains affiliate links, so I may received a commission if you like one of my suggestions.